During the 1960s and 70s, Brazil underwent an accelerated process of transforming its economic, political and cultural spheres. Many of these experiences unfolded under the aegis of updating its material and ideational spheres along clear Capitalist lines, wherein the United States was seen both as a model to be emulated as well as an unreliable partner whose policies and traditions were not applicable to the Brazilian realities. 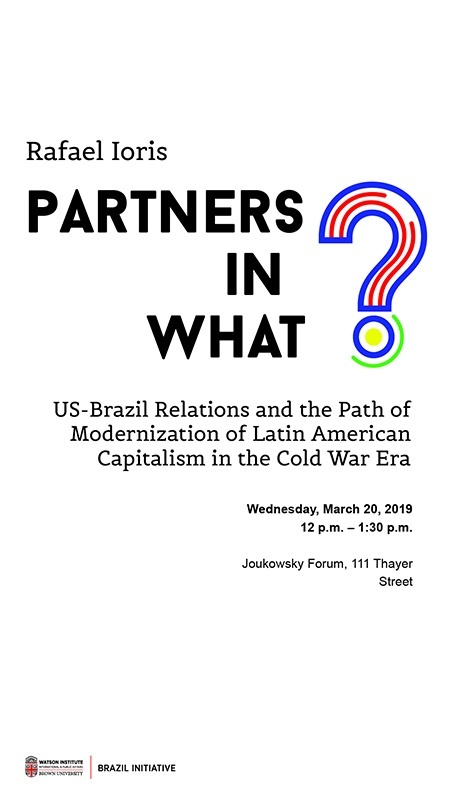 This reflection seeks to examine how different projects of development and narratives surrounding them impacted and were conversely impacted by the context of interactions between historical characters in both countries at the height of Cold War in Latin America. Rafael R. Ioris is Associate Professor of Latin American History at the University of Denver and affiliated faculty at the Latin American Center at the Josef Korbel School of International Studies.